It doesn’t happen often but when the mosfets in a 4QD series controller do blow they can take a number of other components with them. 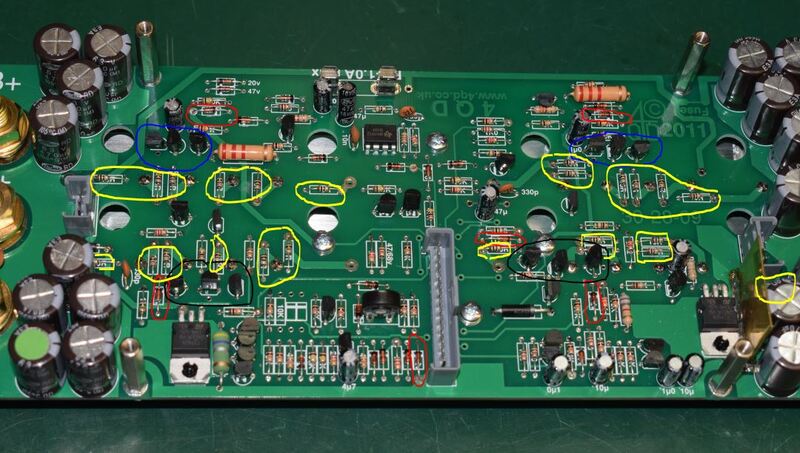 If you are attempting a DIY repair this photo shows the most likely ones that we always check when we do a factory repair. Damage from blown mosfets. Red = 12v zener diodes – often go short circuit along with the main mosfets. Blue = high side drive transistors. Black = low side drive transistors. Yellow = 10 ohm mosfet gate drive resistors. The left and right sides are quite symmetrical, you can usually test one side against the other as it’s rare to have both sides of an H bridge blow at the same time. We recommend fitting suppression components to all motor installations, see this page for more details. This link gives full instructions on how to dismantle the 4QD-series.